Witches, or Warlocks, are at work in Astoria. By 2012, things had quieted down a bit here. 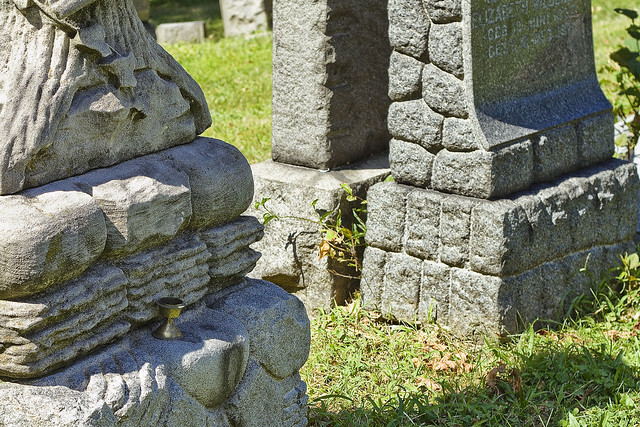 Perhaps the postings alerted the cemetery management to the situation or the magick worker him or herself might have come across them and realized someone was watching. The other day, one had an afternoon to fill, and scuttled over to St. Michael’s to see if any new developments might be observed. 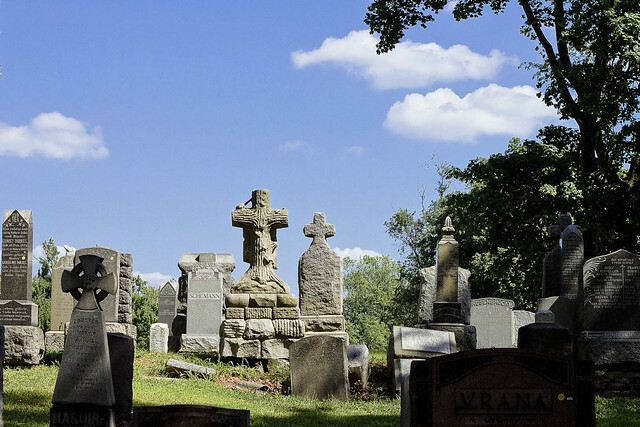 Unfortunately, upon arriving at the graveyard, one observed a crew of groundkeepers hard at work. This meant that any evidence I might find would be disturbed by the actions of lawn mowers and weed whackers, but I headed over to section 10 anyway. That’s where the main “altar’ is. On the ground, as expected, there was naught but grass clippings and the odd piece of wind blown litter. 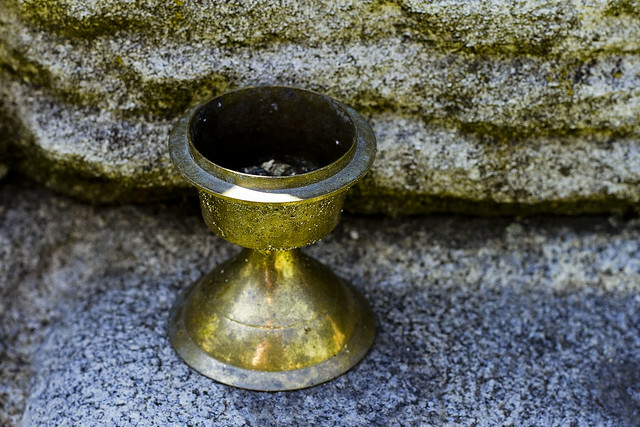 On the ‘altar” there was a small metallic chalice. 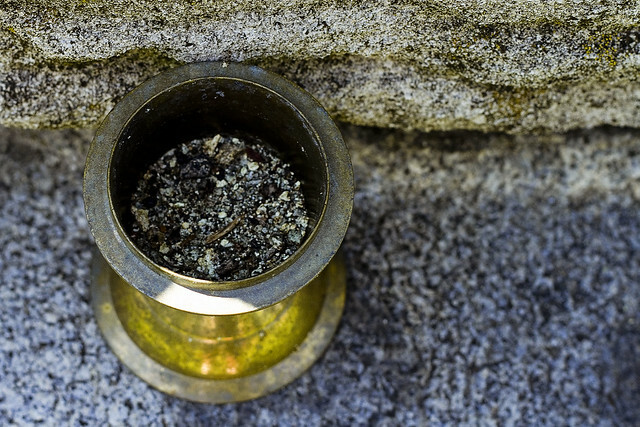 It seemed to be made of fairly common materials, possibly a cheap alloy given the cosmetic qualities of brass. Inside was ash. A particulate and grainy sort of ash. By the way, there’s two cool Working Harbor Committee events going on this weekend you might want to attend. 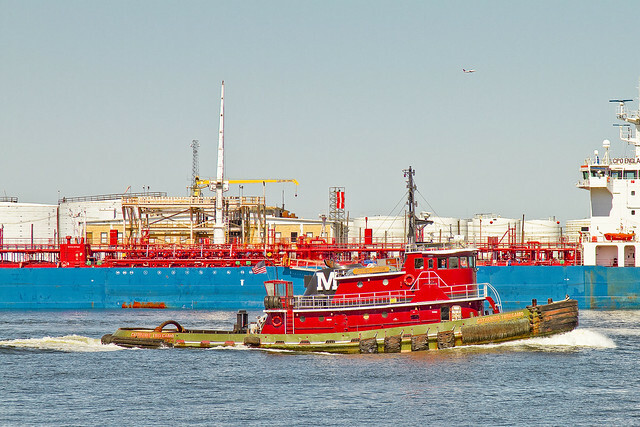 Saturday, the 30th is a Port Newark excursion onboard the Circle Line with Captain John Doswell, Ed Kelly of the Maritime Association of Port of NY/NJ and Maggie Flanagan – Marine Educator South Street Seaport Museum. The boat boards at 10:30, sails at 11, and returns at 1:30. Click here for more info and tix. Sunday, the 31st is the annual Great North River Tugboat Race and Competition. 10:00 AM – Parade of tugs from Pier 84 to the start line. 10:30 AM – Race starts – From South of 79th Street Boat Basin (near Pier I) to Pier 84. 11 AM – Nose to nose pushing contests and line toss competition. Noon – Tugs tie up to Pier 84 for lunch and awards ceremony. Exhibits, amateur line toss, spinach eating contest 1 PM – Awards ceremony. Tugs depart at about 2 PM. For tix on the spectator boat, click here. 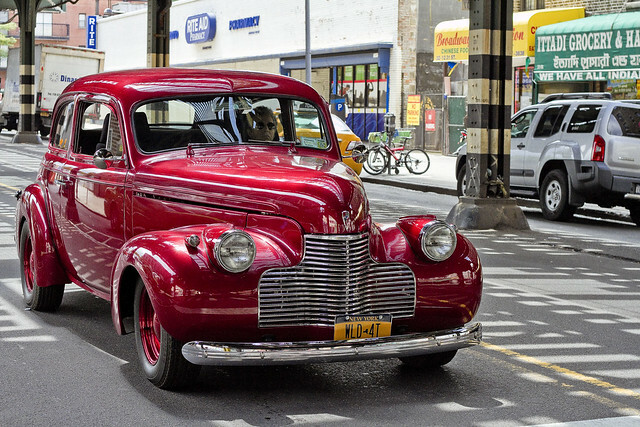 Cool cars are everywhere in Astoria, and I don’t even have a bike. 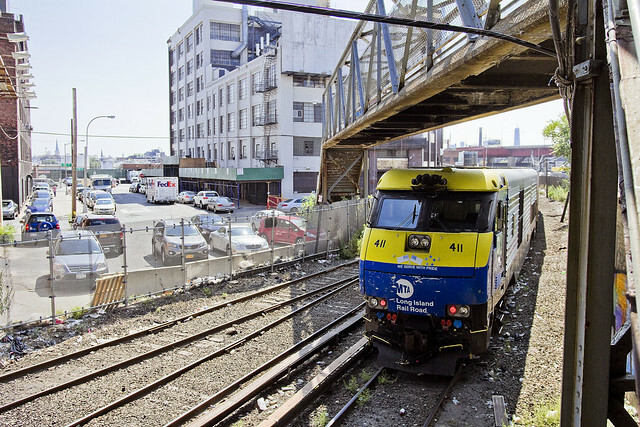 Scuttling along in building shadows, beneath outstretched awnings, along heavily wooded lanes, and under the dripping steel of the elevated subways are the only places one such as myself can hide from the burning thermonuclear eye of god itself as its burning gaze stares down upon Western Queens during the summer. Wan, a pale enthusiast such as myself will quickly combust if overexposed to the ultraviolet and shrinks away from direct exposure. While huddling in these particular absences of light, wonders like the sedan pictured above are encountered. This shot was from fabled 31st street, here in Astoria. 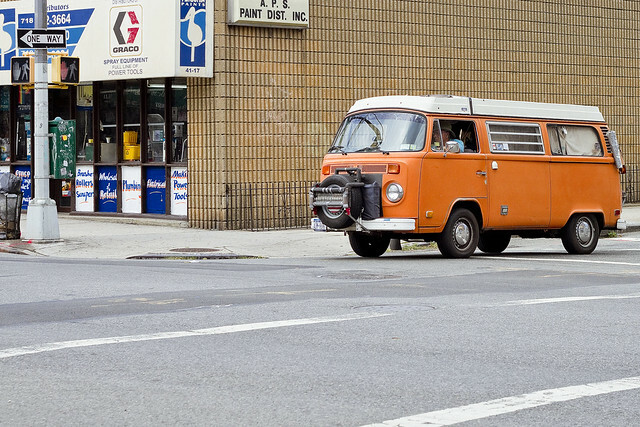 Nearby the location of the passing VW Microbus, this outlandish roadster was racing its engine in anticipation of the changing nature of traffic signals. 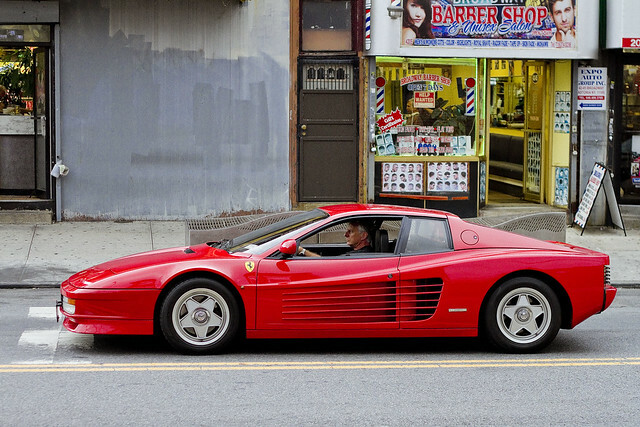 One congratulates at the style and panache of choosing an Italian made Ferrari, but is also dizzied by the ideation of sitting in stop and go traffic on Steinway Street in one. Cool cars, lords and ladies, Queens is full of them. This actually and absolutely astounds one such as myself. 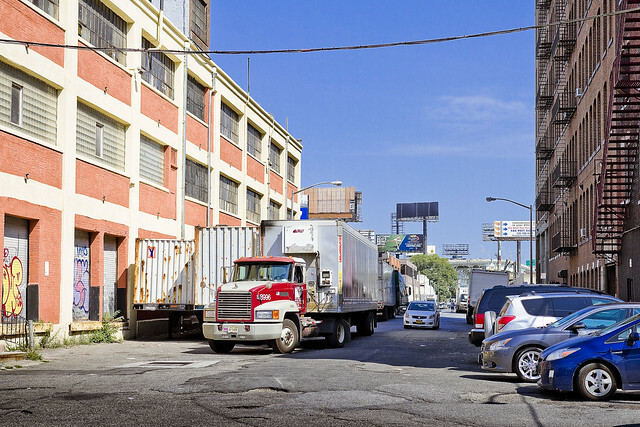 Wandering from Red Hook back to Astoria around a week ago, your humble narrator found himself on the south side of Williamsburg at the triangle formed by Wythe, Heyward, and Wallabout. This splinter of a building is rising up from a paved triangle which is created by the ancient paths surrounding it. 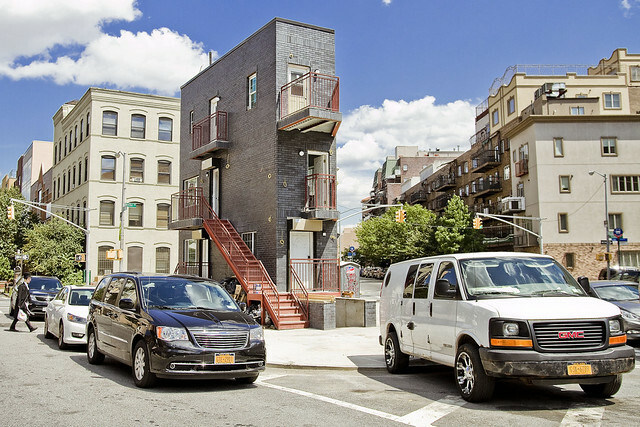 A tiny three story house, it just seems… wow, in Williamsburg, every patch of soil will have apartments on it pretty soon. Wow. 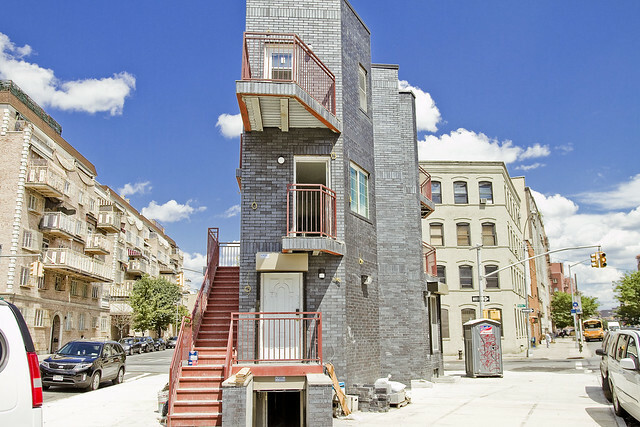 Based on the number of entrances, this has to be a three unit building presumptively? A basement, a first floor, and then a duplex upstairs? Then again, the stairs on the Heyward (left) side might be a common entrance with internal stairs? Talk about an efficiency apartment. Sheesh. Check it out in google street view (this is a very new building, doesn’t even seem to have an address yet) to get an idea of the actual size of this lot – which is just bigger than five parking spots for cars. Note: I did try to find a street address on this structure at NYC DOB, where I was easily defeated and gave up without trying too hard. A few shots from around the neighborhood, in today’s post. Over the weekend, Our Lady of the Pentacle announced that she would be bringing our dog over to Astoria Park for an early morning “off leash” dog gathering, as is her habit. A rare weekend day off for me, last Saturday was, so I accompanied her to the park. When we arrived, low hanging clouds were rolling over mighty Triborough, and your humble narrator found a favorable vantage point from which to capture the scene. 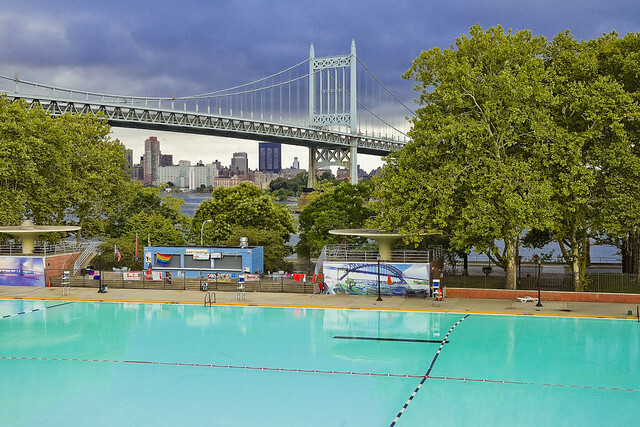 It happens to overlook the heavily chlorinated waters of Astoria Pool, which provided an interesting contrast given the environmental condition of morning ambience coupled with a dark sky. 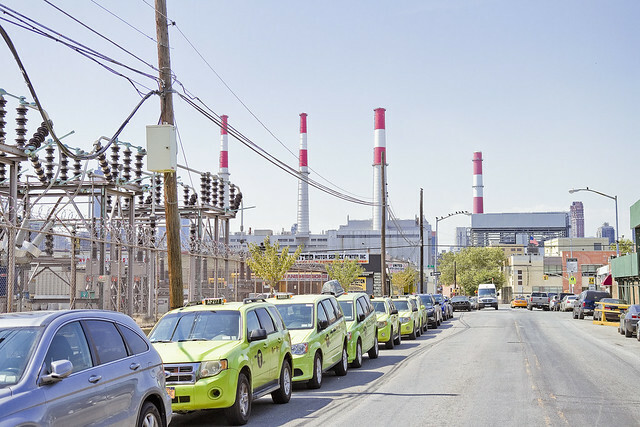 Roaming around Dutch Kills recently, at the borders of Ravenswood and Queensbridge alike, an abundance of Boro Cabs lined a still industrial section of the neighborhood. 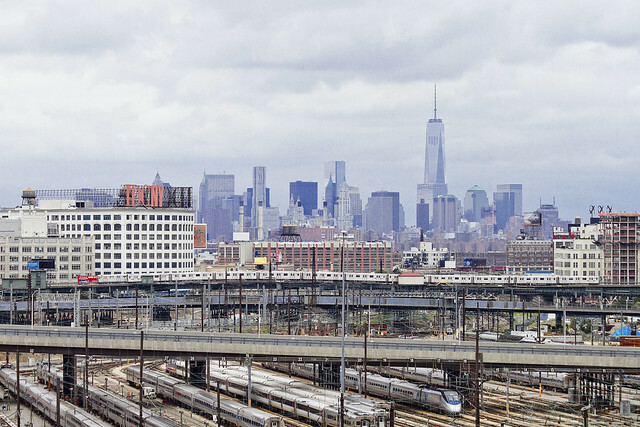 That giant tangle of technology to the left of the frame is an electrical substation, which might belong to Consolidated Edison, and the big pile of red and white smokestacks is the Big Allis Power Plant on the East River. Of course, no one can tell who owns what these days, what with their stock market whatsis and corporate whatchamacallits, but I think the substation is owned by Con Ed. I can report – authoritatively- that on hot days, when walking past this fence line, my headphones have often issued a sudden humming drone – and occasionally electrical shocks have transmitted through and them into my shell like ears. The entire block sounds like this – “mmmmmmmmmmmmmmmmm…mmmmmmm.” This may be one of those spots where a handheld fluorescent bulb might just start to glow. The empty corridor wasn’t so empty the other day when one wandered through on a stroll through Long Island City. Trucks were whizzing about, disgorging palettes of cargo to those who lurked within the warehouses lining the street. Several worrisome characters were closely observing my movements and the particulars of equipment employed in the capture of these images as they quaffed cheap vodka from plastic bottles and shared a marijuana cigarette, one seemingly mixed with cigar tobacco and wrapped in a coarse brown paper or leaf (which one understands as being in fashion at this time). A mild panic came upon me, and one felt himself descending into one of his states. As everyone knows, August 23rd is the Night of the Living Dead. Prepare your “go bags,” Lords and Ladies, and know your zone. 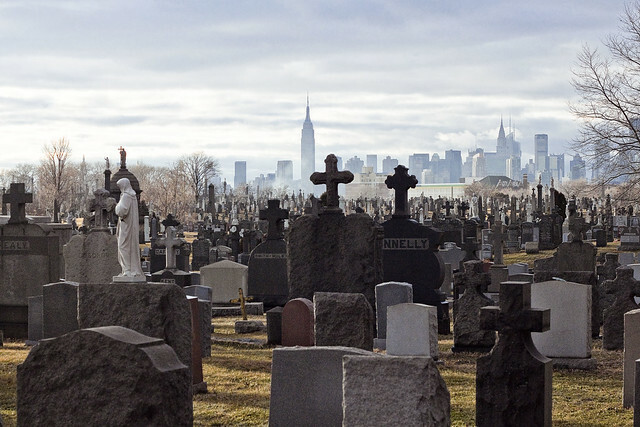 Famously, there are indeed more dead people in Queens than there are living. 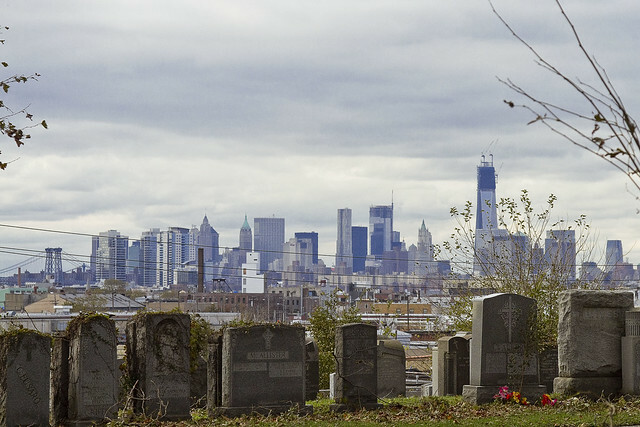 The Rural Cemeteries Act of 1847 forbade interments in Manhattan, which begat what is called “the Cemetery Belt” spanning the borders of Brooklyn and Queens. 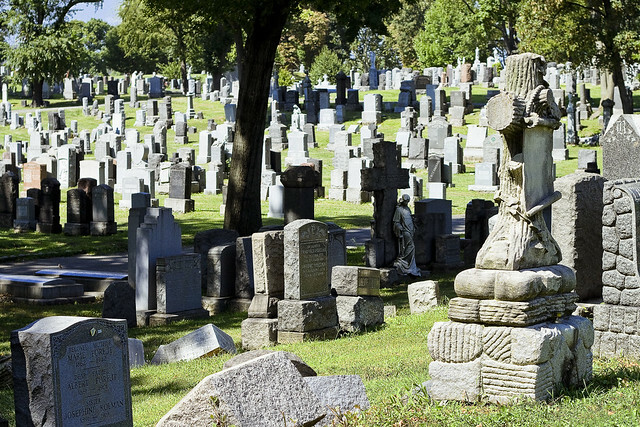 There are three million corpses in Calvary Cemetery alone. Should the dead rise this or any other year, we are going to be in a real pickle. As a public service, zone maps of the danger that various communities face are offered in the hope that individuals can prepare for the coming storm. Courtesy of openstreetmap.org, here’s a shot of western Long Island and the southern tip of Manhattan. Here’s a rough illustration of our study area, the so called Newtown Pentacle. 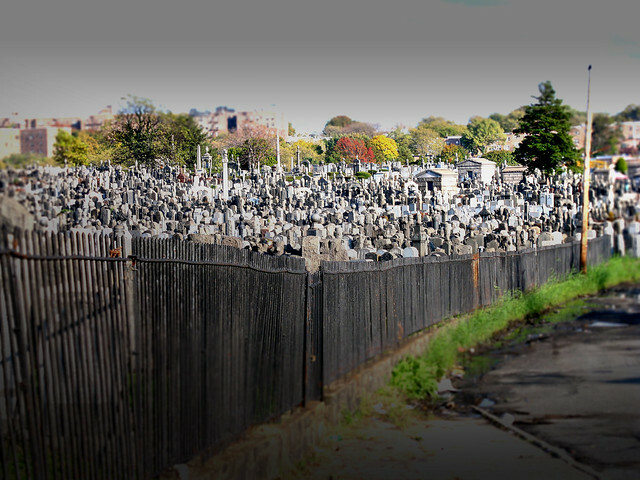 As you might notice, a significant number of cemeteries are found therein, and the area transverses from Bushwick to Astoria and from Flushing to the Wallabout. Nearly all of the area cemeteries are surrounded by stout fencing, and there are but a few points of egress into and out of the polyandrions. How well these often century old fence lines would do against an army of flesh eating ghouls is questionable, but one cannot speculate on their structural integrity. First Calvary, in particular, is isolated by high walls and expressways from its environs, with only two points at which the slavering horde of undead assassins might access the surrounding neighborhoods. One would not want to be in West Maspeth or Blissville on Saturday night, however. In the graphic above, the actual cemetery boundaries are roughly sketched out in orange. 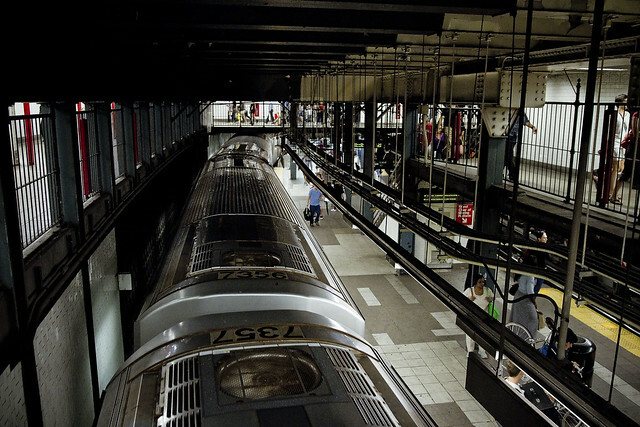 One would imagine that the NYPD would be forced to collapse the East River Tunnels and detonate the roadways of the great bridges to protect the Shining City of Manhattan from the onslaught of the Living Dead. For those of us who reside in the Newtown Pentacle, this heat map is offered. The areas of darkest red are surely goners, and it is suggested that we refer to these areas as Zone A. Zones B & C likely have a fighting chance, should they be well prepared to shelter in place for an interval. Realistically, if you haven’t evacuated within the first twelve hours of the Night of the Living Dead, you’re already doomed. One is never more alone than when waiting for a Subway to arrive. Swaddled in stifling clouds of fungal spore ejaculate and those desiccated airborne particulates of rodent excrement which lend the dripping concrete caverns their particular perfume, the “system” must be the loneliest place on earth, despite the abundant representation of the human infestation whom are found therein. Depersonalization is a specialty of the “system,” which redefines individual personages as “ridership” and let’s everybody who uses it know that there is nothing special about them, whatsoever, despite whatever status they hold in the radiant world above. 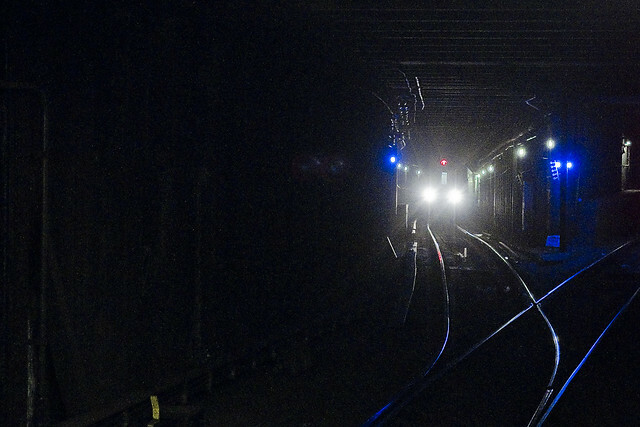 In forgotten side tunnels and hidden chambers, all throughout the system, what might lurk? One does not forget the 1980’s, when rumors of a population of indigents who set up housekeeping in these antechambers abounded amongst the above ground population. Stories of grasping hands reaching up from sidewalk grates at small dogs and women’s ankles tantalized with latent horror, during that particularly dark age in the history of the megalopolis. 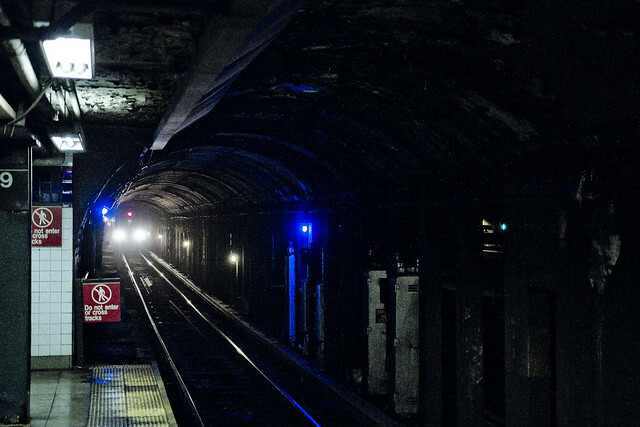 In Jackson Heights, mothers assure their children that the Rakshasha do not hide in the tunnels, as do the folks in Flushing when they tell their kids that there is no È Guǐ waiting to carry them off into the darkness down here. 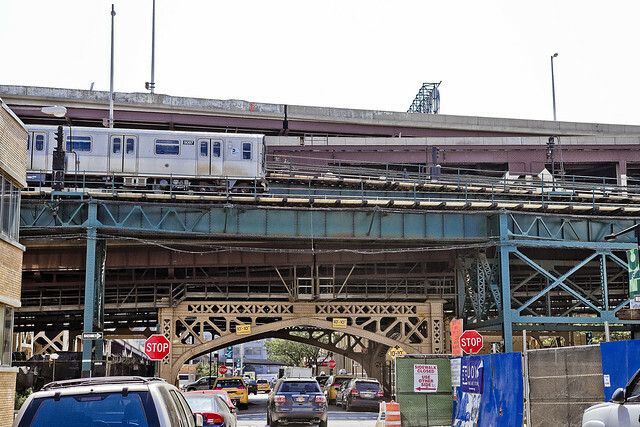 So too do parents console, on the south side of Williamsburg and all along the G and F lines, instructing that there are no Comprachicos hiding in these vaulted tunnels of rotting cement, waiting to make a meal of some toddler or small child. It should be pointed out that MTA workers never go anyplace alone in the system, and instead prefer to move in large groups. Who can guess, all there is, that might be buried down here?